Zac and Julie Brown took over Alderlea Vineyards in April 2017. The winery is located near Duncan on the slopes above Quamichan Lake. The winery was established in by Rodger and Nancy Dosman. 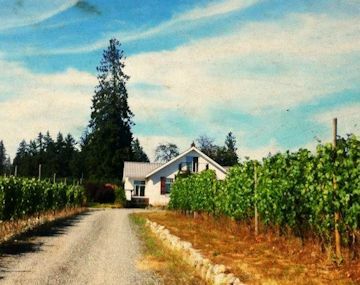 Dosman strong vision for an island vineyard and skilled winemaking made Alderlea one of the pioneers in Vancouver Island winegrowing. Prior to 1911, the town of Duncan was known as Alderlea. Zac and Julie have left behind 20-year careers in Health & Safety and Human Resources respectively, with global corporations to pursue a long-held dream of owning a vineyard and making wine professionally. Not long after getting married, Zac and Julie began entertaining the idea of retreating from an otherwise successful corporate life and owning their own vineyard one day. 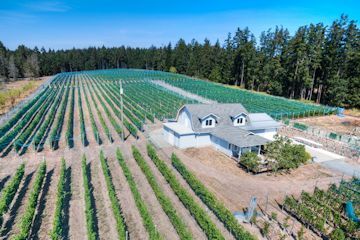 Over the years, they looked at a number of vineyards on Vancouver Island and in the Okanagan, in addition to properties in France, Italy, the US, New Zealand and South America. In the end, the pull of Vancouver Island was very strong, with Zac having grown up in Port Hardy and having family on the island still. When Zac and Julie first visited Alderlea in the fall of 2016, they knew they had found their dream vineyard. The considerable pride, care and attention with which Roger and Nancy founded and managed the vineyard, winery and Alderlea brand were palpable. Zac and Julie are excited to be part of the history of Alderlea Vineyards and to continue to create unique, high-quality wines that epitomise the character and beauty of the Cowichan Valley. The Browns are making a number of improvements at the winery. A new tasting room will open in 2108. The Averill Creek Vineyard is the result of one man’s 30-year passion for wine. Over the past decade, physician Andy Johnston has been preparing for a dramatic career change by apprenticing in the vineyards of Italy, France, Australia, and New Zealand. Averill Creek is the vineyard of his dreams. The winery is a 150 ton capacity winery built on the side of Mt Provost. The Averill Creek Winery takes its name from the pretty little creek that cuts through the vineyard as it runs down the southern slopes of Mount Prevost into the Cowichan Valley of Vancouver Island, British Columbia. Located on Blue Grouse Road in a country forest setting; established in 1989 . The 31 acre winery was build one vine at a time by the Kiltz family. Aug 2012 the winery was sold to New owners Paul, Christina, and daughter Paula Brunner - Possible future plans for Blue Grouse include winery and tasting room renovations, the addition of a boutique inn with a farm-to-table style restaurant, and vineyard updates that would help realize the property's full potential. The soil at Blue Grouse Vineyards is mainly a mixture of clay and sand, however there are also areas of gravelly soil. The winery grows only Vitis Vinifera, the real wine grapes introduced from Europe which are primarily cool climate varieties such as Bacchus Ortega, Pinot Gris, Pinot Noir and Müller-Thurgau. Possible future plans for Blue Grouse include winery and tasting room renovations, the addition of a boutique inn with a farm-to-table style restaurant, and vineyard updates that would help realize the property's full potential. Signature Wines : Pinot Gris, Pinot Noir, Bacchus, Ortega, Black Muscat, Muller-Thurgau. varieties: Pinot Noir, Pinot Gris, Gewürztraminer and Siegerrebe. They also produce highly popular blends like Coastal White and Coastal Red. The whites are crisp, and clean, brimming with varietal fruit. The reds have just a whisper of oak, allowing the true varietal flavour of these unique cool climate wines to shine through. The vineyard remains best known for its World Famous Cowichan Blackberry Dessert Wine and recently released a more aged version called Solera. Philosophy: the production of hand-crafted premium wines made entirely on our own premises, using 100% British Columbia grapes. Damali Lavender Farm, Winery and B&B is a project of three partners, Marsha & Dave Stanley and Alison Philp. The winery opened it's doors to the public in May 2010 with a release of four wines â€˜Alba' a Pinot Grigio named after a white lavender, â€˜Rosea' a sparkling rose named after a pink lavender and two specialty wines, â€˜Lavande' a lavender and white wine blend and â€˜Mure Lavande' a dry blackberry dinner wine balanced using lavender syrup. The future promises more interesting fruit, grape and lavender wines that are unique to Damali and are all made from fruit grown at the farm and within the Cowichan region. When Joe Busnardo retired from his winery in the Okanagan(which he started in 1980's) he relocated to Vancouver Island and started a new winery in Cobble Hill. They are located close to the Trans Canada Highway not far from Cowichan Bay. Their wine shop is open only Friday and Saturday afternoons. Mike and Robin Nierychlo moved from Vancouver to the Island to start their winery. A dream and passion coming true. The adventure started n 2013. Philosophy: Farm the grapes organically and in balance in the vineyard. Then harvest by hand and gently process the fruit in the winery and let nature take care of the rest. All wild yeast (no commercial yeasts have been in our building) Making sure to pay close attention to observing the science of what is happening but only intervening if absolutely necessary. In summary or philosophy is old world and natural. Located just south of the Malahat Drive in Mill Bay (Cowichan valley) Enrico opened in 2010. Enrico Winery is a family-run business. The 50 acre farm was acquired by the Smith Family in 2000. Harry â€œEnricoâ€ Smith and his family lived on a vineyard in Switzerland while he was coaching hockey. It was there that the family first became interested in Wine. At the urging of his brother Newt, the family converted the farm into a vineyard, planting their first 8 acres of Pinot Grigio and Pinot Noir in 2007. Since then they have expanded to 15 acres of grapes with Ortega, Cabernet Libre, and Cabernet Foch. Production around 2000 cases. The first bottles of Wine were produced in 2009, on brand new state of the art equipment, by winemaker Daniel Cosman. The original sheep barn was converted and our Cantina-tasting room was opened in 2011. Merridale, nestled in the mouth of Vancouver Island's Cowichan Valley, is a destination the whole family can enjoy. Located in Cobble Hill, just 40 minutes from Victoria The cider house provides a unique venue, surrounded by the orchards. Some of the varieties of apples grown include Dabinett, Tremlett's Bitter, Frequin Rouge, Hauxapfel, Chisel Jersey and Bulmer Norman, to name a few. on eau de vie or water of life. Philosophy: Merridale Ciders are handcrafted, all natural and made from 100% undiluted juice. 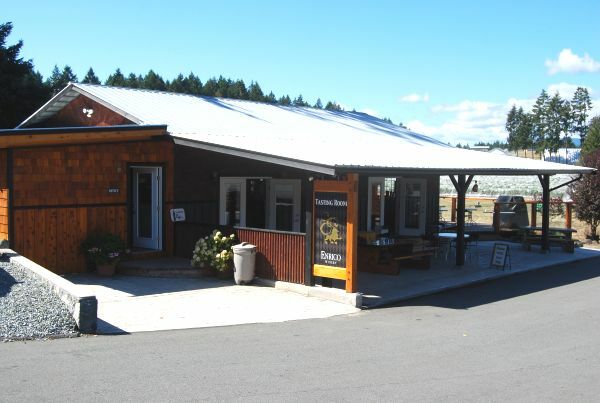 This beautiful 10 acre winery located in the Cowichan Valley is owned by Holford Family. Linda is the general manger and Mark is the winemaker. Mark is a third-generation winemaker. After making amateur wines for over 20 years, Holfords decided to establish a winery due to the many requests from people who wanted Mark's wine and winemaking experience. The winery is currently producing 1500 cases of wine. Rocky Creek is an innovative winery trying new things such as experimental grapes from the Blattner crosses and training the vineyard differently than anyone else on Vancouver Island. Mark is an environmental engineer and â€going greenâ€ is just a part of Rocky Creek normal practices. To be true to the region and only make wines from our island grown grapes. We want to be a heritage winery and pass this onto our children. The Holfords dream is to pass their very successful winery on to their children. Philosophy. True to the region, estate grown and quality. Sustainable and eco-friendly. The best wines made from the region. A unique winery in Cobble Hill producing Raspberry, Blueberry & Blackberry wines. Bill & Jeanne Aten bought the farm to operate as a mixed farm in 1982 and it has seen many changes from raising animals to producing raspberries and blueberries and now fruit wines. The plan is to keep the winery small scale and manage the quality of our product. They also make jams, jellies, syrups and vinegars. The tasting room is also an art gallery featuring work by local artist Jean Aten as well as gifts made by local craftspeople. Nestled in the foothills of Mill Bay, surrounded by pasture and minutes away from the Pacific Ocean lies Unsworth Vineyards. Vistas, ambiance and entertainment coupled with the perfect coastal climate for growing some of the world's most unique and finest of wine grapes. Owned By Tim and Colleen Turyk who own Bell a Coola Fisheries Ltd. . The winery is under development. They have 30 acres with 12 acres planted in Foch and Blattner. The historic 115-year-old heritage farmhouse has been turned into a winemaker’s residence along with a restaurant. Located in Cobble Hill, Giordano Venturi and Marilyn Schulze-Venturi are committed to growing the highest quality grapes without pesticides or herbicides, and are crafting world class wines. Michelle, Marilyn's daughter also plays an important role at the winery. The family also produces balsamic vinegar. The vinegary, or acetaia, was expanded by 2,000 sq. ft. in 1999. It houses dozens of large "nursery" barrels and 108 ageing barrels custom made in Italy from chestnut, cherry, acacia, ash and oak. Philosophy: Each wine is an adventure woven around the season, the soil and the personalities of the varieties and winemakers. We add minimal amounts of sulphide at bottling to some of our wines. None is added to our Brut or dessert wine. To retain as much of the character of the grapes as possible, we neither fine nor sterile-filter, so storage temperatures become important: we recommend 10° to 12°C (50° to 55°F). After so much effort in the vineyard and winery, we are not willing to compromise on quality by putting an unpredictable piece of bark in the neck of the bottle. The Zanatta family operates a 25 acre vineyard in the northwest corner of the valley. Their historic family home was built in 1903. The 120 acre farm was originally the site of a dairy farm when the Zanatta's purchased it in 1958. Since then 30 acres have been planted in vines, including Ortega, Cayuga, Auxerrois, Pinot Grigio, Pinot Nero, Muscat, Merlot, and Madeleine X Sylvaner. The remainder of the farm is in pasture, hay fields, forest and old fruit orchards. Vinoteca, food and wine bar was established in May of 1996. This new venture for Vigneti Zanatta allows us to explore the fascinating art of pairing simple country cuisine the wines. Vinoteca was Ileana Zanatta's creation. She took the family's 1903 farm house, restored it as closely as possible to its original character, added her own unique style and created an eclectic place to dine or sip your afternoon away. Philosophy:Our goal is to produce quality wines with exceptional regional character. We achieve this by using only Vancouver Island grapes and unrushed winemaking techniques which allows for complete expression of the wines.